My daughter wanted to make a from-scratch cake for a class project on her own. We found some recipes on-line and altered them a bit to our tastes. Honestly, this was the best tasting cake I have ever had! We have made it several times since. We made it for Memorial Day and will be making it again for Independence Day. I have also made cupcakes with this recipe. The cake itself comes out white, but can be dyed to take on any color you choose. 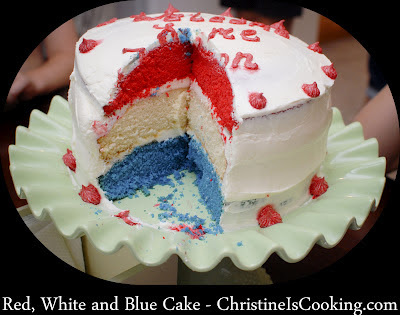 We decided to make a red, white and blue triple layer cake. (1) Preheat oven to 350 degrees. Spray (3) 8 inch cake pans generously with non-stick spray. (2) Whisk the flour, sugar, baking powder, salt and baking soda in large bowl. Add the buttermilk and Crisco. Beat with a mixer for 2 minutes. (3) Add the egg whites, vanilla and almond extract. Beat an additional 2 minutes. (5) Bake 30 minutes or until cooked through.